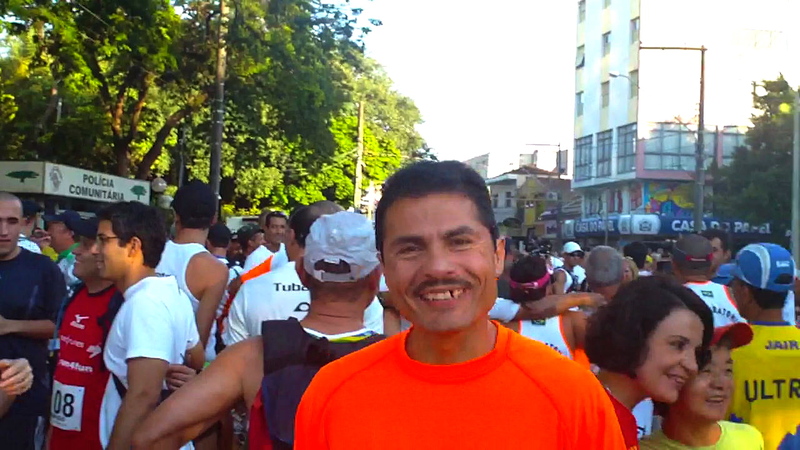 It was, perhaps, the most difficult aspect of running nearly 340 miles over a 7 day period. Actually, it was for certain. 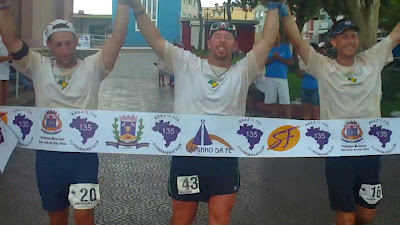 As if running 130 miles in 3 days wasn't enough, the next portion of Running the Caminho Da Fé required 55+ hours of non-stop suffering - 135 miles, 30,000+ feet of elevation gain and loss.....The Brazil 135 Mile Ultramarathon. The first 3 days were difficult. 14 hours...13 hours...7 hours...rain...mud... The next 55 hours would prove to be an unbelievable challenge. The bright side...when finished with BR135, we'd only have about 80 miles left to cover. First, you may notice that the entire BR135 course and elevation chart was captured by my Garmin Forerunner 310XT. Wait a minute. The 310XT boasts up to 20 hours of battery life. How did you get it to record 55+ hours worth of data without having to stop to recharge it? 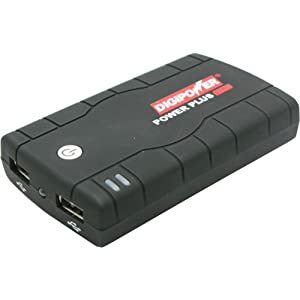 Use the Enercell or Digipower 2 in 1 USB AC Adapter and Battery Pack. It is a very simply set-up and requires about 30-40 minutes to charge the Garmin to full strength (depending, of course, on how low the Garmin battery is at the time you re-charge it). You simply loosen the Garmin on your wrist and attach the charging clip, plug ihe USB end of the charging clip into the Enercell/Digipower device, and tuck the Enercell/Digipower device into your pocket (even better, if you have RaceReady shorts, it fits nicely into the mesh pockets). For the BR135 portion of the journey, we would only have support from Glauber. Lynne, who had worked tirelessly with Glauber over the first 3 days was now a runner, attempting her first 135 miler. Lynne shot right out of the gate at the start of the race - expected for someone who had been waiting patiently to run for 3 days. 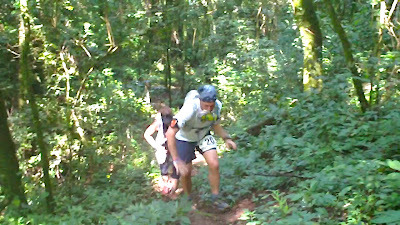 We watched her running with a purpose, so focused and determined that at one point she blew right by Glauber and the support truck, not even realizing that she had missed him. 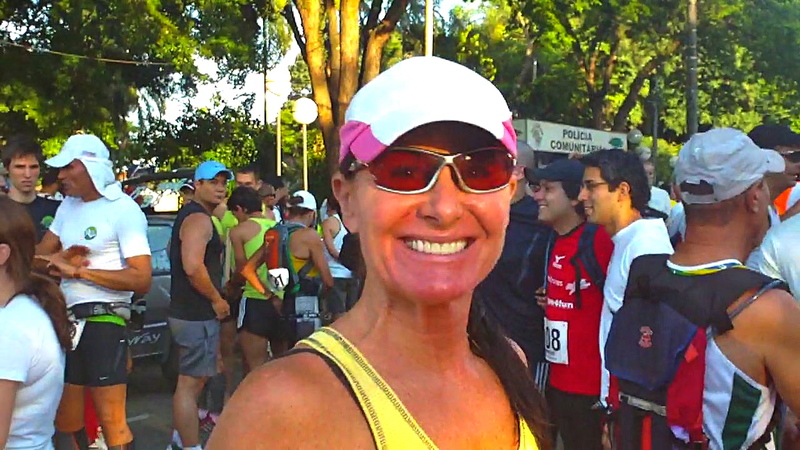 Lynne had entered the race with an injured knee (I believe it was a torn meniscus). Coming out of a difficult climb into the coffee fields, she stepped to the side and I cold see her grimace in pain. It was worse now, and soon thereafter she was, at times, reduced to a steady limp. Lynne gave it all she could, but in the end, injury won out and she had to drop from the race. 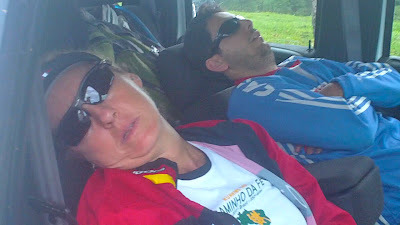 Yet, she refused to take a ride to Paraisopolis, insisting on supporting me, Chris and Jarom through the race. BR135 would be a series of ups and downs. Last year I struggled climbing Pico do Gaviao. Not this year, as the three of us powered our way to the top of the highest point on the BR135 course (the 26 mile mark of the race). My lowest point came somewhere before the start of the first night when everything simply went stiff. It was emotional, and I seriously thought it was the end of the journey for me. Sleep deprivation took its toll. At times, Jarom and I were literally falling asleep on our feet, weaving back and forth across the trail. The second night (I think it was the second night), we were so exhausted that we decided to take a short nap on the trail. Jarom had an idea - lay the tarp on the ground and put our feet up on the bushes. Sounded reasonable. It only took 5 minutes for my body to cool down and start to shiver. All of a sudden I was freezing. I got up and walked around. Chris said to get back on the tarp (which I reluctantly did), and he then proceeded to make a tarp-taco out of the 3 of us. Great, now there is dirt in my eyes and mouth and I'm trying my best to spit it all out. 5 more minutes of shivering, and then the best words I heard all day from Jarom - "Tony...psst...should we just get up and go?" Hell yes! 10 minutes later we had warmed up again. There were plenty of memorable and hilarious moments. We went through some town at night and they had a festival or carnival going on. It sounded like a rodeo. 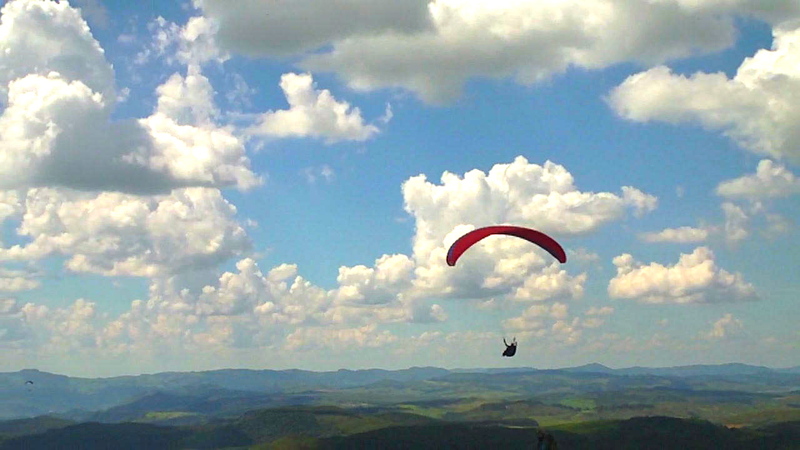 I never expected to hear "Callin' Baton Rouge" (Garth Brooks) blasting on a loud speaker in Brazil. Then there was Maria Rita Fernandes running in the reverse direction down a hill towards us...screaming that a man looking like a zombie had jumped out of the bushes and was chasing her. Try as we might, we couldn't locate the "zombie" at all. It was so funny watching her walk with Chris and grab his arm and shirt as she looked in all directions. Of course, finishing...now that was memorable. 55+ hours of exhaustion. An emotional finish for all 3 of us. 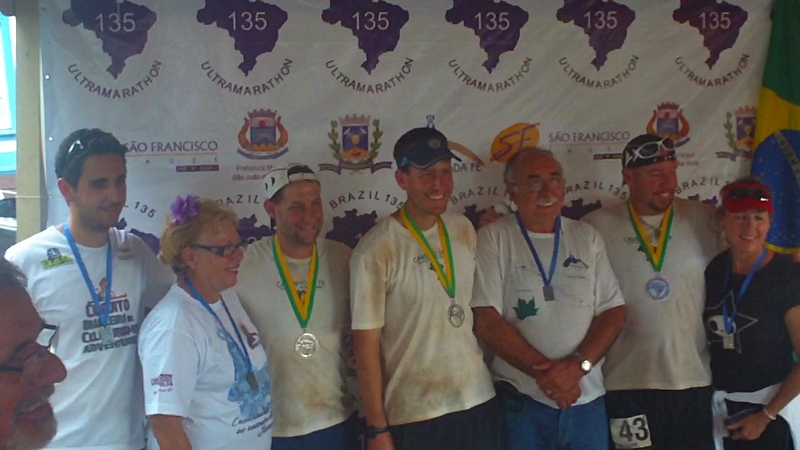 Another amazing race put on by Mario and Eliana Lacerda and their amazing staff. Now, just 80 miles of the Caminho Da Fé to go. Ironically, we took only a minimum amount of videos on the course. Chris's flip video recorder stopped working at one point, then revived itself. The best way to capture some of what we experienced is to simply look at the pictures (above) and watch this 9 minute video that contains a variety of video clips taken along the way...so, enjoy! The stories are great but that video tells it all. Amazing! I'm still so wowed by this. That race on it's own is an insane challenge, but to just have it as one part of an even bigger run? Very impressive.